In spite of a huge set back from Hurricane Sandy, for Things that Make Scents & OhSoy! soy candles business is good. 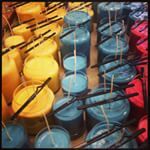 The candles are very much in demand – especially around the holiday seasons. But the method currently used to melt and pour the wax is holding the business back from growing. Currently they are using a 150 lb. melting pot, and dispensing the liquid wax into 4 lb. pouring cans. The wax is then poured by hand into the jars. Janine would like to purchase a Mark VIII candle melting and dispensing machine. It would allow them to pour thousands of candles in one day, instead of a mere hundred. She currently has three sales reps on the road, and keeping up with the orders using the current method is a true challenge. With the machine, she would be able to take on more orders, hire more people, and generally expand her business operations. The Mark VIII costs $20,884.36 – and that is a lot of money for one entrepreneur to come up with. To fund this important purchase, Janine Predmore has created Kickstarter Crowdfunding Campaign. The funds from the campaign would cover the cost of the Mark VIII, rewards for the pledges from contributors, and additional wax and jars to help with the initial costs for creating added candles. Contribution rewards range from a wick-dipper to extinguish your candles safely to selecting a scent and naming it (polite names only, please). In between, the rewards are – of course – candles. If you love the ambiance of soft candlelight and gentle scents, this your crowdfunding campaign. More than that, you will have the satisfaction of promoting an ecologically sound business that will provide added employment opportunities. In today’s economy, that is saying a lot. More than that, you will be empowering a successful entrepreneur to grow her business. She has already proven that she understands how to run a business – Things That Make Scents is already past the five year mark, indicating that it is like to continue making OhSoy! soy candles and many other beautifully scented items. You can also help out by “liking” Things that Make Scents in Facebook, sending a tweet or two, and making a note to yourself to add OhSoy! candles to your holiday shopping list. If you like to have your candles without indoor air pollution and without soot marks on your ceiling, then this is the crowdfunding campaign for you. About: Janine Predmore is the CEO of Things that Make Scents (www.thingsthatmakescents.com), the company that makes and sells OhSoy! candles. Soy candles are made from a renewable resource and minimize the air pollutants caused by burning candles.